Ninjutsu has withstood the tests of time, so naturally, ninjas can be found in the zombie apocalypse. Armed with their wits and the 3 Piece Biohazard Shinobi Survivalist Kunai, these deadly masters fight for an end to the undead! By taking the iconic kunai and improving it to withstand the most resilient of targets, these zombie-themed kunai bring forged 440 steel together with the ancient traditions of ninjutsu. A sleek two-toned finish emphasizes the traditional silhouette with a black body and sleek silver edges. A vivid green biohazard symbol is engraved on the blade, a matching nylon cord wrapping around the knifes handle for a classic apocalyptic touch. Have this trio at your disposal by carrying them in the durable nylon sheath that makes being an armed ninja as easy as breathing! 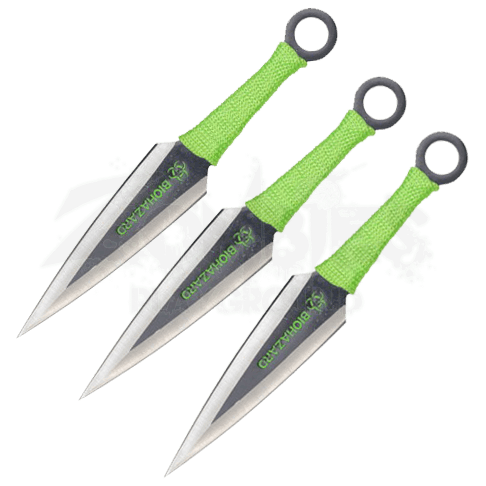 Whether practicing your Jutsu, displaying your skill, or disposing of the undead, the 3 Piece Biohazard Shinobi Survivalist Kunai will always get the job done!